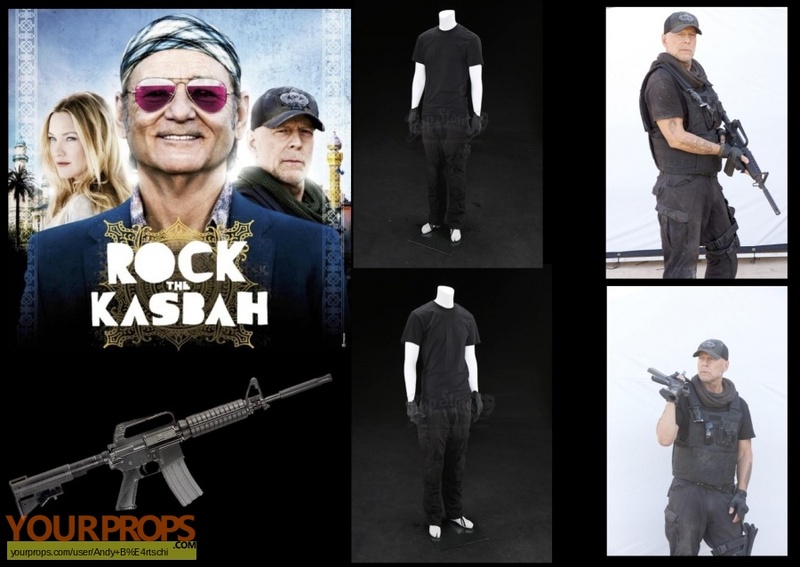 Bombay Brian's (Bruce Willis) costume from Barry Levinson's music comedy Rock the Kasbah. While on a USO tour in Afghanistan, a music manager discovers a talented young Afghan girl and manages her through a televised singing competition. Bombay Brian wears the costume when he escorts Richie (Bill Murray) to deliver rounds of ammunition to the Pashtun village. The costume consists of a black t-shirt, cargo pants, a belt, sunglasses and gloves. The black shirt is made by 5.11 Tactitcal and is a size medium (M). The black cargo pants are made by Blackhawk! and are a size 36. The black nylon belt is made by 5.11 Tactical and is a size large (L). The black gloves are made by 5.11 Tactical and is a size extra-large (XL). A pair of Oakley sunglasses completes the set. ** The content of this listing is the sole responsibility of Andy Bärtschi. Yourprops.com, its owners, agents and assigns assume no liability.